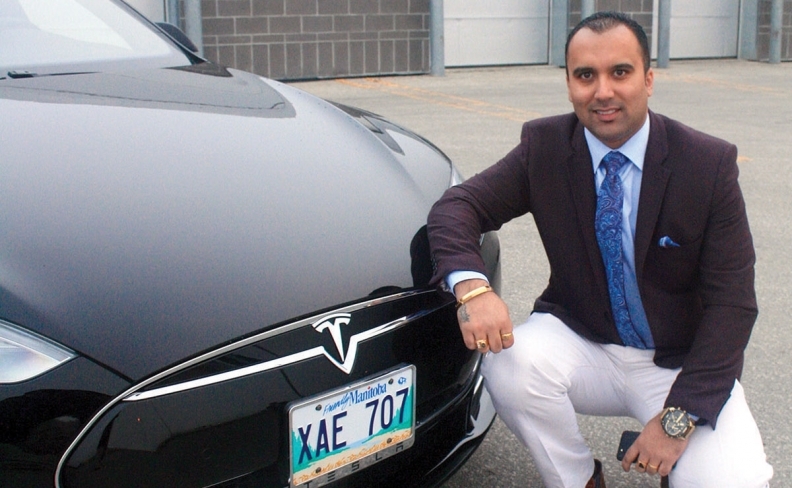 Ricky Brar, president of Hollywood Limousine Service in Winnipeg, is taking delivery of 32 Teslas. The challenges of maintaining electric vehicle fleets might be restricting them to major urban centres for now, but the concept is beginning to gain steam. More EVs are sold in Quebec than in any other province, and so Montréal has become a logical hub for electric-fleet pilot projects in recent years. However, Toronto and Vancouver have also seen activity, and one prairie city is playing host to a surprising initiative. About a year ago, Montreal-based taxi service Taxelco launched Canada's first all-electric taxi fleet. Named Téo, short for Transport Écologique Optimisé, the company operates a fleet of 50 electric vehicles comprising Nissan Leafs and Kia Soul EVs. The Auto-mobile company is not quite fully electric, but it's close. The Montréal-based subsidiary of the Communauto car-sharing operation uses a fleet of several hundred Nissan Leafs and Toyota Prius C hybrid vehicles. On the rental side, Ecomoto began operations in Vancouver in July and is fully electric with Nissan Leafs and a Tesla Model S. Rather than operate a storefront, the company offers free delivery to areas near Canada Line Skytrain stations and the Vancouver International Airport. Hollywood Limousine Service in Winnipeg runs a fleet of 35 vehicles, including a 24-passenger stretch Hummer and a 17-passenger Ford Excursion. However, president Ricky Brar has begun taking delivery of 16 Tesla vehicles — Model Ss and one Model X tall wagon — to be converted into an all-electric limousine fleet. When complete, it will likely be a Canadian first. While success stories are mounting for smaller independent companies operating in urban centres, changing larger organizations or the public sector is slower going. Canada Post currently operates a small fleet of electric vehicles in Vancouver, and while the Canadian Union of Postal Workers proposed an all-electric fleet and charging hubs at all post offices in a revitalization proposal put forward in February, a large-scale replacement of delivery equipment seems unlikely. However, the infrastructure is expanding, most notably in Ontario under the provincial government's recent commitment to install 500 charging stations in areas such as the 401 corridor and Ottawa. With the impending launch of longer -range vehicles such as the Chevrolet Bolt, charging infrastructure appears to be on track to develop substantially over the next few years.